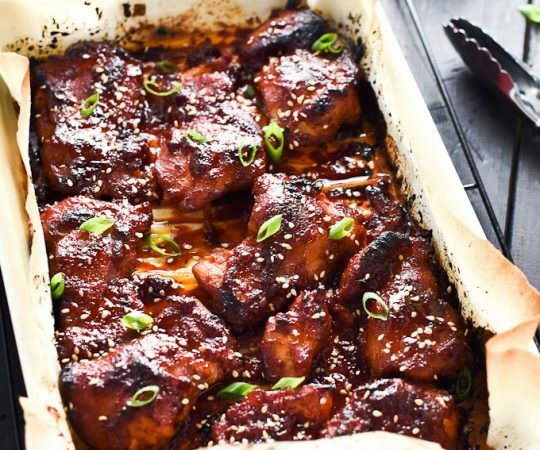 These delicious Korean Paleo Chicken Thighs are marinated in a sweet and smoky chili paste called gochujang and make an easy and healthy weeknight meal. Serve them with a side of low carb cauliflower rice. You will LOVE them! Place the chicken thighs in a resealable plastic bag. Add the honey, gochujang, coco aminos, sesame oil, ginger, and garlic and seal the bag. Squish the bag around a little so that the marinade coats each piece of chicken. Let the chicken marinate for 1-24 hours in your fridge. Note: If you don’t have time to marinate the chicken mix all the marinade ingredients then pour it over the chicken after you add it to the baking dish. Line an 8×11 baking dish with parchment paper. Preheat your oven to 425 degrees Fahrenheit. Pour the chicken and all the marinade into the prepared baking dish and move the chicken around, so it is in a single layer. Bake in the oven for 25-30 minutes, turning a few times. The chicken will be cooked through at this time but to get a nice dark red chicken you can broil it at 425 degrees for another 10-15 minute, this is how I like it best. If you aren’t able to control the temperature that your oven broils at, make sure to keep a close eye on it and reduce the cooking time so the sugar in the marinade doesn’t burn. While the chicken is cooking, prepare the cauliflower rice. Working in batches pulse the cauliflower in your food processor until it resembles rice. If you don’t have a food processor, you can grate or finely mince the cauliflower. Add the cauliflower rice to a large frying pan over medium heat and add 1/4 cup of water. Cover the pot and let the cauliflower steam for 6-8 minutes, or until it is soft. Remove the cauliflower from the heat and season to taste with sea salt. Serve the chicken with sesame seeds and sliced green onions and some cauliflower rice on the side. The ingredients in gochujang can vary by brand; many at the store I shop at don’t even have the ingredients listed in English! If eating a 100% paleo diet is important to you make sure you check the ingredient list or try making your own. You can also buy gluten-free gochujang here.